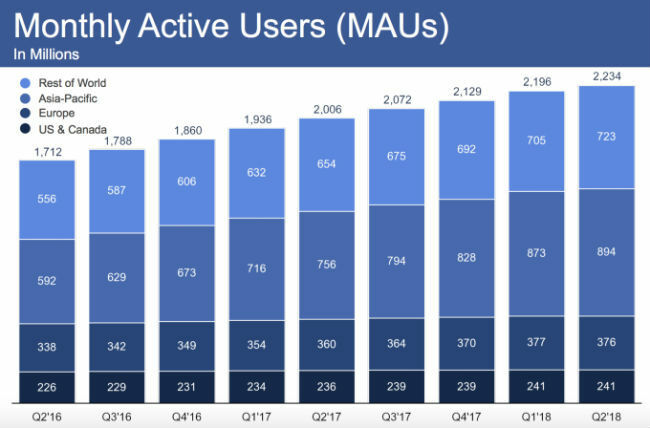 Facebook has announced a marginal increase in its monthly active users that reached 2.23 billion at a growth rate of just 1.54 percent. As Facebook registered a marginal growth in the second quarter of 2018, the social media giant had a silver lining to highlight in the form of the announcement that 2.5 billion people around the world used at least one of its apps: Facebook, Instagram, WhatsApp or Messenger. 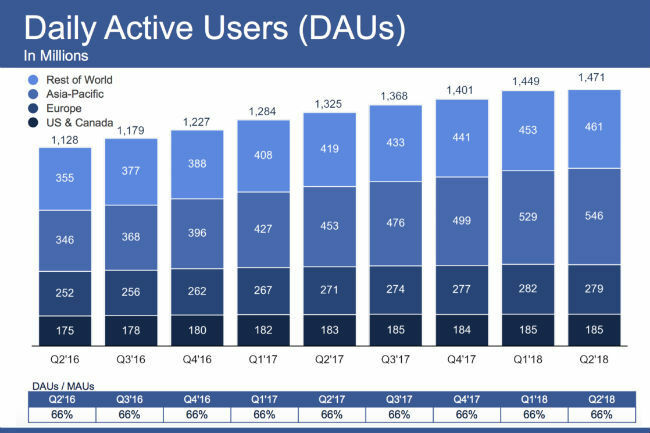 Facebook CEO Mark Zuckerberg released the numbers during Facebook’s Q2 2018 earnings call and said that the 2.5 billion count is of the individual users rather than active accounts, which excludes when people have multiple accounts on a single app. “For the first time today, we're also releasing how many people use at least one of our apps -- Facebook, WhatsApp, Instagram, or Messenger – and that's 2.5 billion people each month. This number better reflects our community for a couple of reasons. First, it refers to individual people rather than active accounts, so it excludes when people have multiple active accounts on a single app. And second, it reflects that many people use more than one of our services. Dave (CFO David Wehner) will explain this in more detail later,” the executive said. While talking about the numbers, Facebook said there are now 2.23 billion monthly users on the platform, 1 billion users on Instagram, 1.5 billion users on WhatsApp and 1.3 billion users on Messenger. Facebook CFO David Wehner clarified that Facebook’s monthly active user count of 2.23 billion “does count multiple accounts for a single user, and that accounts for 10 percent of Facebook’s MAU.” The clarity on numbers came few hours after the company announced the results of its Q2 2018 earnings. The results reflect the public anger that Facebook has been facing since the role it played in the Cambridge Analytica scandal and its involvement in data sharing partnerships with several smartphone-makers became public. The company's incompetence to tackle the fake news issue effectively did not help either. 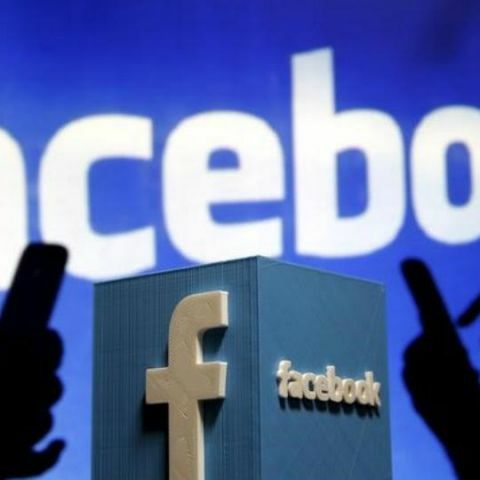 Facebook reached 2.23 billion monthly active users, which is up just 1.54 percent, owing to users preferring platforms such as Instagram over the social media website. The growth percentage is worrisome for the company as it is almost half of Q1’s 3.14 percent. Facebook earned $13.23 billion in revenue, missing Thomson Reuters consensus estimates of $13.36 billion. The Daily active users hit 1.47 billion, up only 1.44 percent as compared to Q1’s 3.42 percent. However, Zuckerberg had a positive take on the results. “We had another solid quarter. Revenue grew 42 percent year-over-year to $13.2 billion. And Facebook now has more than 2.2 billion monthly actives, with almost 1.5 billion using it every day. I want to start by talking about all the investments we've made over the last six months to improve safety, security and privacy across our services. This has been a lot of hard work, and it's starting to pay off, he said . I want to buy a rangefinder device of at least 900 m range, can you suggest me a good one under 10-15 K.